The bus graphic- Images are key! People prefer consuming visual content and putting a giant bus on the front of this flyer is a great way to grab attention. Plus it's relevant and fits nicely with the "Are You On Board?" slogan. The faux event ticket- Season pass to fun and excitement! It clearly states that it's not actually an event ticket, but what a fun way to present the 2014 season races. And yes that's a shout-out to MotorsportReg.com underneath the bar code where you can "reserve your seat". ALWAYS include the link to your event registration. Cork board reminders- The whole idea of the back of the flyer is that it's your personal cork board filled with reminders for the year. The post-it notes look 3-D, the note at the top right has the jagged edge from where you just ripped it out of your notebook and there are push pins on each one. So creative. Love, love, love! Clear, concise information- On both the front and back of the flyer the information about the races is short and sweet- name, track, date. Too much information dilutes your message. 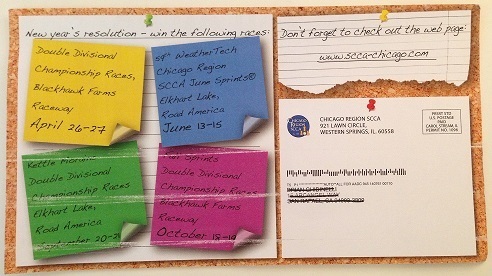 Making it personal- Just above the post-it notes is the phrase "New year's resolution- win the following races:" You're more likely to engage someone when you make your message personal. 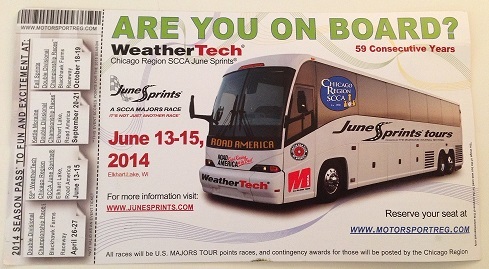 Clearly I'm a huge fan of the effort the team from Chicago Region SCCA put into this flyer. It's attention-grabbing, it clearly conveys their message and it's just so clever. It goes to show that you shouldn't give up entirely on traditional forms of advertising. Kudos! If you're ready to get on board with Chicago SCCA club racing, you can find their events on our calendar by searching Chicago SCCA.